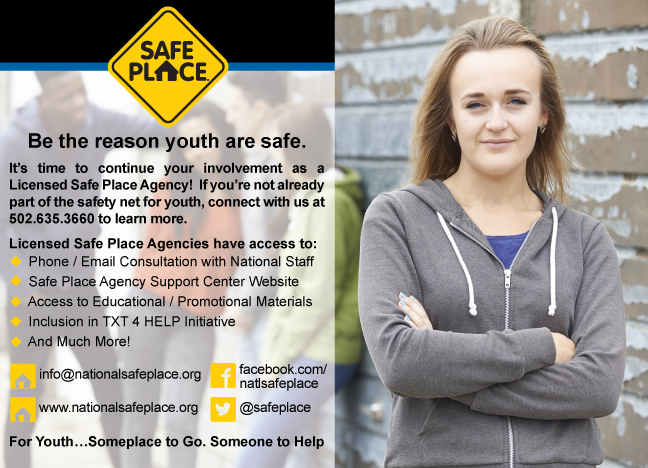 After forty-years offering support to member organizations who serve youth and families, National Safe Place Network (NSPN) has learned that needs vary by organization, in communities, and over time. We offer a flexible structure designed to help members affordably access the benefits they need. Base membership is $200. We have three additional benefit packages which can be combined in an All-in-One for a $200 discount, essentially waiving the base membership fee. As we approach the start of a new membership year July 1st, we want to share with those of you who may not know how you could benefit from making NSPN your network. The NSPN Base Membership is an easily affordable investment for organizations who want updated information, helpful resources and access to a national network of dedicated professionals. Base members receive discounts on registration for NSPN events like the bi-annual Focus Conference. Networking opportunities include access to quarterly executive leadership calls and eligibility for national awards. Base members also have opportunities to share your expertise with peers in the field by participating in Innovation Circles research projects or contributing as a guest blogger on NSPNsights. Tell us about promising practices in your organization, community, or state or something else that you’re passionate about. We never know how sharing our stories impacts and motivates others. The Professional Development benefits package is designed for agencies dedicated to educating, motivating, and cultivating their staff. Succession planning starts with identifying potential leaders and developing their skills to grow people in your organization. The Emerging Leaders Institute (ELI) is one grand example. Participants examine their past, present, and aspiring leadership journey with other NSPN members. As a former middle manager, I often struggled most with meeting the needs of both upper management and program staff. Playing the middle man/woman between two vital entities that each have a different focus, skill set, understanding and responsibility can be draining and at times overwhelming. Professional coaching for middle managers is invaluable support for learning to create the right balance. The NSPN Training Center benefits package is targeted toward organizations seeking access to tools, trainings and other resources that help staff best serve youth, young adults and their families. Along with access to the Destination for Online Training (DOT), Training Center members receive specialized services. NSPN staff or Subject Matter Experts will work with members to customize webinars or other training to meet their needs. Training Center members also received discounts on our most popular site-based learning opportunities, including CYC and Youth Thrive. Learn more about Child and Youth Care: Foundations Course and becoming a certified youth care worker here: https://www.nspnetwork.org/child-youth-care-certification. More information about the Youth Thrive Curriculum is available here: https://www.nspnetwork.org/youth-thrive-curriculum. This benefits package is targeted toward organizations who seek to strengthen or maintain a solid and sustainable organizational structure. Disasters can happen anywhere, anytime and to anyone. Being prepared to respond quickly and appropriately is key to how individuals, organizations and communities recover in times of crisis or adversity. Some member organizations have suffered losses or dealt with traumatic incidents. NSPN provides crisis debriefing for staff and volunteers of member agencies with the Organizational Development package. NSPN can also assist Organizational Development members by reviewing human resources policies and procedures and providing feedback. It’s a good practice to revisit policies and procedures periodically. Amendments may be necessary as changes in mission, organizational structure or populations served occur over time. The value of NSPN base membership and add-on packages increase the more members take advantage of their benefits. And your best investment is the All-in-One package, with access to benefits to improve your programs and services, invest in your staff and leaders, and develop organizational capacity. As a bonus, NSPN members receive a $200 discount when they upgrade to the All-in-One package. I am happy to answer any questions you may have and show you how much we value our members. You can reach me, April Carthorn, at support@nspnetwork.org. Your Needs. Your Network. Together We Can. 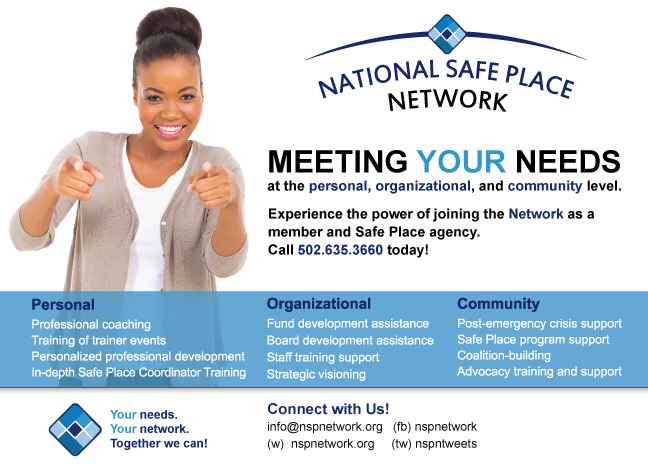 It’s that time of year again – time to renew or begin your membership and Safe Place license with National Safe Place Network (NSPN). We’ve enjoyed offering benefits and services to our members and licensed agencies this past year and we hope you will join us for an exciting, eventful 2015-2016. For more than three decades, NSPN has provided services and support to agencies like yours, serving youth and families. Hundreds of thousands of youth have benefited from your work and involvement as a youth service provider. You are the Network’s most important asset – without youth and other agencies who believe in participating in and learning from an experienced community, there is no Network. Starting on April 1, you will have the opportunity to sign up for or renew your membership with NSPN. As a Safe Place agency, you will have the opportunity to renew your license. Be on the lookout for forms coming in the mail, and be sure to check out our updated webpage beginning April 1.